As you know, I love all things connected to Serendipity 3, the lovely fire-trap of a cafe in Manhattan -- especially the Forbidden Broadway Sundae (which should have its own holiday to celebrate its specialness) but I fear that I must now draw the line. The Frozen Hot Chocolate-a like cookie jar was very cute. 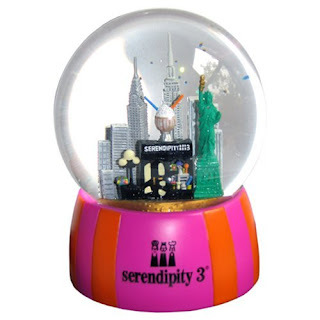 The Serendipity 3 Snow Globe is...NOT! You. Are. Ugly. Tacky, even. The stripey base looks cheap and the Statue of Liberty found within looks identical to the grubby pencil eraser Liberties you can find in any dime store Big Apple souvenir kiosk. The NYC skyline looks like it has been plucked from other souvenirs that didn't shift off store shelves. If you really want a remembrance of the decadent desserts at Serendipity, purchase one of their lovely cookbooks and forgo this crap.